Este mes de noviembre, familiares y amigos se reunirán para subir al escenario virtual de Band Hero y saltar al estrellato. 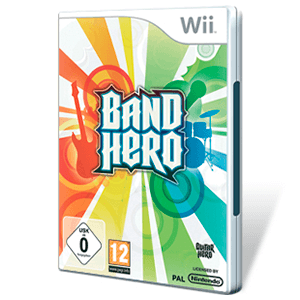 De los creadores de Guitar Hero, una de las mejores franquicias de videojuegos de todos los tiempos, Band Hero aporta un nuevo género musical basado en los éxitos más populares del momento combinados con los temas clásicos que alguna vez o dos hemos tarareado. Band Hero incluye los mayores éxitos de artistas reconocidos a nivel mundial como Taylor Swift, No Doubt, Lily Allen, The All-American Rejects y los Jackson 5. Gracias a sus distintos niveles de dificultad, jugadores de todas las edades serán capaces de experimentar la increíble sensación de tocar en un grupo de música formado por ellos mismos. Band Hero permite crear el grupo que siempre soñaste, combinando como más te guste la guitarra, la batería y por supuesto tu propia voz. ¡Tu música favorita te está esperando! · 3 Doors Down - "When I'm Gone"
· The Airborne Toxic Event - "Gasoline"
· The All American Rejects - "Dirty Little Secret"
· Aly and AJ - "Like Whoa"
· Angels & Airwaves - "The Adventure"
· Ben Harper and the Innocent Criminals - "Steal My Kisses"
· Big Country - "In a Big Country"
· The Bravery - "Believe"
· Carl Douglas - "Kung Fu Fighting"
· Cheap Trick - "I Want You To Want Me (live)"
· Cold War Kids - "Hang Me Up To Dry"
· Counting Crows - "Angels of the Silences"
· Culture Club - "Do You Really Want To Hurt Me"
· Dashboard Confessional - "Hands Down"
· David Bowie - "Let's Dance"
· Devo - "Whip It"
· Don McLean - "American Pie"
· Duffy - "Warwick Avenue"
· Duran Duran - "Rio"
· Evanescence - "Bring Me To Life"
· Everclear - "Santa Monica (Watch The World Die)"
· Fall Out Boy - "Sugar, We're Goin' Down"
· Filter - "Take A Picture"
· Finger Eleven - "Paralyzer"
· The Go-Go's - "Our Lips Are Sealed"
· Hilary Duff - "So Yesterday"
· Hinder - "Lips Of An Angel"
· Jackson 5 - "ABC"
· Janet Jackson - "Black Cat"
· Jesse McCartney - "Beautiful Soul"
· Joss Stone - "You Had Me"
· Katrina and The Waves - "Walking On Sunshine"
· The Kooks - "Naive"
· The Last Goodnight - "Pictures Of You"
· Lily Allen - "Take What You Take"
· Maroon 5 - "She Will Be Loved"
· Marvin Gaye - "I Heard It Through The Grapevine"
· Mighty Mighty Bosstones - "The Impression That I Get"
· Nelly Furtado - "Turn Off The Light"
· No Doubt - "Just A Girl"
· No Doubt - "Don’t Speak"
· OK Go - "A Million Ways"
· Papa Roach - "Lifeline"
· Parachute - "Back Again"
· Pat Benatar - "Love Is A Battlefield"
· Poison - "Every Rose Has Its Thorn"
· Robbie Williams and Kylie Minogue - "Kids"
· The Rolling Stones - "Honky Tonk Women"
· Roy Orbison - "Oh Pretty Woman"
· Santigold - "L.E.S. Artistes"
· Snow Patrol - "Take Back the City"
· Spice Girls - "Wannabe"
· Styx - "Mr. Roboto"
· Taylor Swift - "Love Story"
· Taylor Swift - "Picture To Burn"
· Taylor Swift - "You Belong With Me"
· Tonic - "If You Could Only See"
· The Turtles - "Happy Together"
· Village People - "YMCA"
· Yellowcard - "Ocean Avenue"
La serie Hero se bifurca en una versión más blandita que resulta ser muy sólida.